The English Foxhound is an athletic hunting dog. The skull is wide and the muzzle is long. The nose is about 4 inches long (10 cm) with wide-open nostrils. The teeth should meet in a scissors bite. The hanging ears are set low, lying flat to the head. Some choose to "round" the ears, which means about 1 1/2 inches are cut off of the end of the ear. The large eyes are brown. The legs are straight and the cat-like feet are round. The long tail is set high. The coat is short, hard, dense and glossy. Coat colors come in black, tan and white, for example tricolor (black, white and tan), or bicolor with a white background, or any combination of these three. 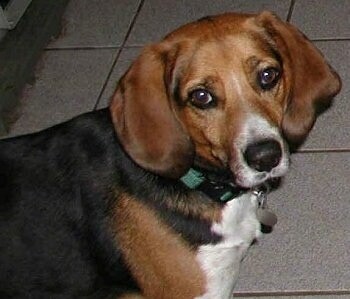 The English Foxhound is a courageous, passionate hunter. High energy, it needs a lot of daily exercise. It responds well to leadership and is willing and able to be obedient, but is not as responsive as some breeds and training takes patience and a general understanding of the canine animal. They are friendly with people and excellent with children, but prefer to be in the company of other dogs and do well with other animals. The English Foxhound likes to bay. They are untiring, able to run at a consistent speed for five or six hours without stopping. Can become destructive without enough exercise. 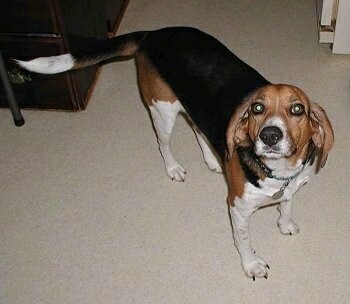 The Foxhound does slow down somewhat at about seven or eight years old. The English Foxhound is a bit stockier and slower than the American Foxhound, but has similar traits. There are two types, field lines and show lines (bench). Field types are bred for hunting and field trial work. The bench type is bred for conformation shows. Both types are energetic and need daily exercise, but field lines have a higher energy level and need even more exercise. The dominancy level in this breed varies even within the same litter. If you are not the type of person who can display a natural air of calm, but firm authority, then be sure to choose a pup that is more submissive. 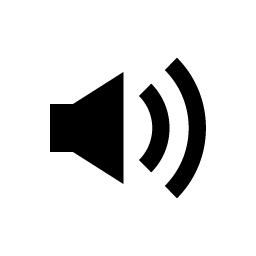 The temperament of both show and field lines vary widely, depending upon how the owners treat the dog and how much and what type of exercise they provide. Both types are still primarily a pack hunting dog, though they can make good companions if given sufficient exercise. It is recommended that if you are looking to own an English Foxhound solely as a pet, that you are an avid jogger, biker or hiker and are looking for a canine partner. Even show lines will need a great deal of exercise, just a little less, as field types are extremely active. This breed not only needs extensive daily exercise, but also an owner who has a determined, consistent loving approach, setting rules and structure and consistently sticking to it. English Foxhounds are not recommended for apartment life. They are very active indoors and do best with acreage. This breed needs extensive exercise to be happy. It needs to be taken on a daily, long, brisk walk or jog where the dog is made to walk beside or behind the human holding the lead, as in a dog’s mind, the leader leads the way and that leader needs to be the human, not the dog. Putting a backpack on the dog can help it drain its energy quicker. Jogging or biking with the dog running beside you is ideal, as these dogs can go for hours without getting tired. They are active hunting dogs that may take off after any interesting scent, so do not take the English Foxhound off its leash unless you are in a safe area. Foxhounds that are lacking in mental and/or physical exercise will become high strung and may develop destructive, behavioral issues. An average of less than 10 years. The English Foxhound dates back before the 1800s, in Great Britain. The Brits had kept records of over 250 different foxhound hunting packs, where studbooks were kept by the British Masters of Foxhounds Association since at least 1800. Records of English Foxhounds showed up in the USA dating back to the mid-1900s. 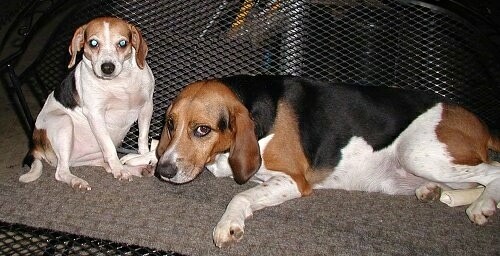 They were developed by crossing a variety of hounds with the Bulldog, Greyhound and the Fox Terrier. Used in packs to chase fox with hunters on horseback, the Foxhound has impressive stamina and a good nose. He can run steadily for hours at a time. 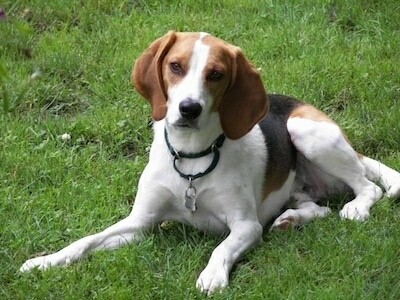 Some of the English Foxhound's talents are hunting, tracking, watchdog and agility. 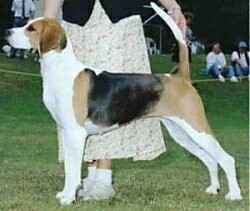 The English Foxhound was recognized by the AKC in 1909. The English Foxhound is a little slower and a bit stockier than the American Foxhound. 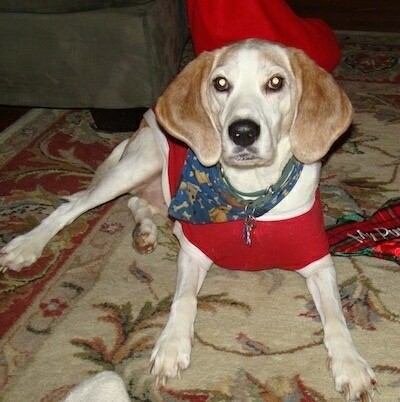 Hunter the English Foxhound at 2 years old—"We adopted Hunter on April Fool's Day, 2006. He was 2 years old. He has been a great dog to have. As the kids are getting old he doesn't get as much exercise as he used to. He does have a tendency to dig and go crazy for squirrels."